Have you ever told yourself (or heard) these phrases? I’ve used a few of these excuses myself, so if you recognize yourself in any of them, you’re not alone. The problem is that phrases like those listed above signify a lack of personal responsibility for our circumstances. They shift the focus of our problems onto other people and things — and perpetuate the myth that we are fated to live our inevitable lives with no control over the outcome. It’s a simple trap to fall into because it feels easier to blame others for our circumstances than to shoulder the responsibility ourselves. While it can feel comfortable and easy to point the finger of responsibility outward, and attribute our lack of success to external circumstances, the simple truth is our lives are worse off for it. By blaming other people or things, we give away our power. We perpetuate a form of self-delusion that reduces the control we have over our own lives and can leave us feeling helpless, powerless, and anxious. Ultimately, this way of thinking and behaving is a habit. Over time, we’ve become used to blaming external factors for our circumstances, and it has turned into an automatic response. Further embedding this habit, we’ve also been told by “higher authorities” that it’s not our fault that our lives aren’t perfect — it’s due to macro-level factors like the economy, government, globalization, crime rates, commercialism, banks, or ruthless corporations. Or, on a micro-level, it’s the fault of our bosses, coworkers, parents, DNA, partners, kids, neighbors, or pets. To top it off, many of us feel overwhelmed by the increasing complexity of modern life and unsure of our role in what seems to be an out-of-control, overblown world. In reality, we have more control over our lives than we think we do. And the more we shift the blame outward, the less likely we’ll enjoy a healthy, engaged, and fulfilling life. Not only can our physical health be negatively affected by our lack of personal responsibility, but our mental and emotional health can also be at risk. Thankfully, like all bad habits, this unhelpful way of thinking can be broken, and you can regain ownership (and control) over your life. Before we get started on how to break that habit, let’s explore the psychology behind our level of personal responsibility, and how that affects our health, happiness, and wellness. How we think and act is determined by many factors including our belief system, personality, upbringing, and behavioral tendencies. In the realm of personal responsibility, how we view the world and our ability to influence our own circumstances is governed by our locus of control. This locus of control is either internal or external. If you have an internal locus of control, you have higher levels of personal responsibility. You’re more likely to take ownership of your decisions, hold yourself accountable for your actions, work hard for the things you want, and act in accordance with what’s important to you. You are more likely to enjoy better health and have lower stress levels, and less likely to be overweight. You’re also more likely to achieve goals, have more confidence and self-esteem, be happier, and enjoy a more rewarding career. On the other hand, if you have an external locus of control, you tend to blame external factors for your circumstances. You see other people (or things) as reasons for not achieving your own goals. You’re more likely to be influenced by other people, feel caught up in the flow of life, and feel powerless to change. You may also feel hopeless when faced with difficult choices or situations. You’re also more likely to suffer from preventable health issues, lead a passive lifestyle, and be prone to anxiety and stress. You tend to feel unsure about yourself and your abilities, and you’re less likely to strive for the things you want in life. Clearly, having an internal locus of control helps us lead a more engaged, fulfilling, and proactive life. If, however, you identify with having an external locus of control, there are ways to retrain your mind and develop a stronger sense of ownership for your life. This means making a conscious choice to change, being willing to get uncomfortable, and taking steps to cultivate an identity of self-responsibility and accountability. Humans are ingenious at developing creative solutions when we need to. Necessity is, after all, the mother of invention. So, if something is important to you — whether it be your health, fitness, relationship, career, education, or happiness — you will find a way despite the obstacles. An excellent exercise to help with this mindset switch is to write down all possible options for resolving your challenging situation. Let go of logic and allow yourself to write down wild and crazy ideas. The purpose is not to come up with a perfect solution straight away. Instead, the process of brainstorming can lead to creative thinking, problem-solving, a plan of action, and a sense of control over your outcomes. When we lack ownership, we tend to fall into the passive trap of saying “I don’t have a choice.” In reality, we always have a choice — even when we don’t actively make a choice, we’re still making a choice by default. By acknowledging our options, we ingrain a sense of personal responsibility and develop conscious decision-making. For example, perhaps at the end of a long day, you tell yourself you’re too tired to go to the gym. Try re-framing that language to signify your active choice, i.e. “I choose not to go to the gym tonight.” By saying those words out loud, your gut will tell you whether those words are a valid, responsible reason — or if you’re blaming external circumstances via an excuse. This positive reinforcement of choice will help develop your internal locus of control. When you hold yourself accountable to others, you are more likely to take ownership of your own actions. This, in turn, will build a sense of accountability to yourself. Being accountable to others can also provide additional support during tough situations, by ensuring you don’t fall back into previous behavior patterns. That’s why a structure such as the Whole Life Challenge is important when developing self-responsibility. The accountability of the Challenge’s daily scoring provides an opportunity to consider your behavior, reflect on your choices, and make decisions for the following day. The accumulation of those choices and decisions has a real and measurable effect on your results at the end of the Challenge. You are, ultimately, responsible for your Challenge experience. And, joining a team during the Challenge provides an extra level of accountability and support when making your daily choices. Blaming external forces for your circumstances means never having to live outside your comfort zone. While comfort zones may feel safe, change never happens there. To grow, develop, and create a fulfilling life, we need to step outside our comfort zone and build a sense of responsibility for our outcomes. Like any beginner, the first time we try something new we’re likely to fail a few times. And that’s totally okay. Failure is nothing to be afraid of — it’s one of the most effective ways to learn and is a clear indicator that you have influence over your outcomes. Failing, learning, and practicing are the keys to progress. They help you identify a gap, develop a plan, and move forward. Again, this ties in with the Whole Life Challenge philosophy of progress, not perfection. Being willing to make mistakes, learning from those mistakes, and creating sustainable (imperfect) progress helps to develop a sense of control, direction, and responsibility. If you watch the nightly news bulletin, you’d be forgiven for thinking the world is a dangerous, scary, out-of-control place. Similarly, many social media channels and online “news” outlets are rich with fear-producing stories aimed to make us feel powerless about the state of the world and our role in it. Consuming too much of this media reinforces the belief that external forces are to blame for our personal circumstances. So, be aware of the media’s effect on your thought patterns, and choose to engage in ways that educate, inform, and enhance your life. Taking responsibility for your thoughts, actions, and life can feel challenging. It requires a willingness to learn from your mistakes, to own your successes and failures, and to stop blaming others for your circumstances. But, taking ownership of your life also builds character, grit, and self-respect. It allows you to proactively create a fulfilling, meaningful, and healthy life where you decide how to respond to your circumstances with accountability and fortitude. Once we understand the quality of our life is largely influenced by our mindset, focus, and actions, we have the freedom to choose our response. So, take ownership of your life — own your decisions, be willing to fail, and become the change you wish to see. Michelle is a gym owner, a life and mindset coach, and a recovering workaholic. 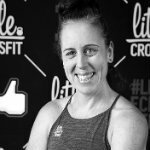 She spent twenty years in the corporate world before leaving to focus on her gym (Little CrossFit) and coaching business (Little Coaching). Michelle helps people become fitter and healthier while navigating life and career changes. She is passionate about coaching her clients to be more resilient, break overwhelm, and uncover a more fulfilling life. In her downtime, Michelle loves nothing more than a good book and a great cup of tea.